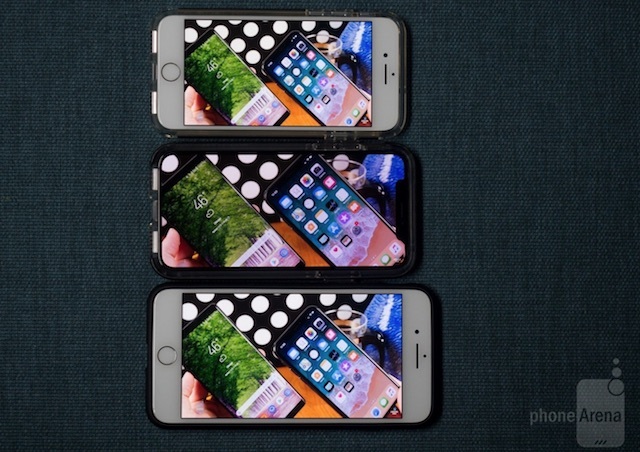 According to a new comparison by PhoneArena, measuring actual screen area when viewing most standard definition video on iPhone X vs the iPhone 8 and 8 Plus, it seems that the usable screen area on iPhone X shrinks to that of a standard aspect phone with a 5″ diagonal for SD videos, which is 16% less than what the iPhone 8 Plus has to offer as screen area while watching video. So in terms of watching video on your iPhone, the advantage seems to shift significantly form iPhone X to the cheaper iPhone 8 and 8 Plus. Since the iPhone X has a 19.5:9 display aspect ratio, it blackbars regular formats that form the vast majority of YouTube videos, or crops some part of the video out when zoomed-to-fill in compatibility mode. It must be noted however that when watching a movie or TV series shot in the 2:1 Univisium format (such as House of Card on Netflix), the power shifts to the iPhone X, although these are still few and far between.